The technology behind Bitcoin -- that electronic money almost nobody understands -- is finally on the verge of going mainstream. American Express (AXP), Bain Capital, Deloitte, Goldman Sachs (GS), MasterCard (MA), the New York Life Insurance Company, the New York Stock Exchange -- all of them have poured millions of dollars into Bitcoin firms recently. Overall, a record-breaking $1 billion so far has been pumped into Bitcoin-related tech startups. Banks are investing in the technology that powers Bitcoin, but not the currency itself. This technology promises to change the way we trade stocks, send money to each other, get paid at work, and much more. What powers the Bitcoin network is an incredible system called the blockchain. It's the reason the software can verify transactions all over the world. That's what's attractive to banks and high-tech firms. It's essentially a perfect record log. That same record log lives on every computer on the Bitcoin network. And it gets updated every few minutes with a new "block" of transactions. The thing is, the next block is built on top of the old one, so you can't just go in and change old data. It's a effective way to stop fraud. That's hugely different from today, where records are centralized. Hack into a bank, and it's easy to falsify them. But the blockchain keeps the same record in lots of computers. A fake record would be immediately spotted by every other computer on the network. There are all sorts of purposes for this kind of record keeping. Nasdaq is tapping blockchain technology to create a more secure, efficient system to trade stocks. DocuSign, a company that specializes in electronic contracts, just unveiled a joint idea with Visa to use blockchain to track car rentals and reduce paperwork. Next week, Microsoft (MSFT)will unveil details about its venture into "smart contracts" that use blockchain technology. It's partnering up with Ethereum, a blockchain project that operates outside of Bitcoin but uses the same concept. Microsoft wants to incorporate that into its Azure service, which rents out computer servers. Meanwhile, this new obsession with blockchain technology has reached a point that companies are even experimenting with creating smaller, "private blockchains" inside their own offices. They hire companies like BlockCypher, a startup out of Redwood City, California. Among the top of the list is Chain, a company that helps others apply the blockchain to their business. Earlier this year, it raised $30 million from Capital One (COF), Citi (C) Ventures, the Nasdaq (BANK) stock exchange, Visa (V) and others. The appetite became most apparent last week at Money2020, the largest financial conference in the world. One in five attendees at the conference thought Bitcoin's blockchain technology will have the biggest impact on financial services in the next three to five years, according to a Capital One survey. What's driving that investment rally? Stodgy banking and venture capital companies are finally embracing the technology instead of demonizing it as weird and dangerous. Sure, Bitcoin has anti-establishment roots. 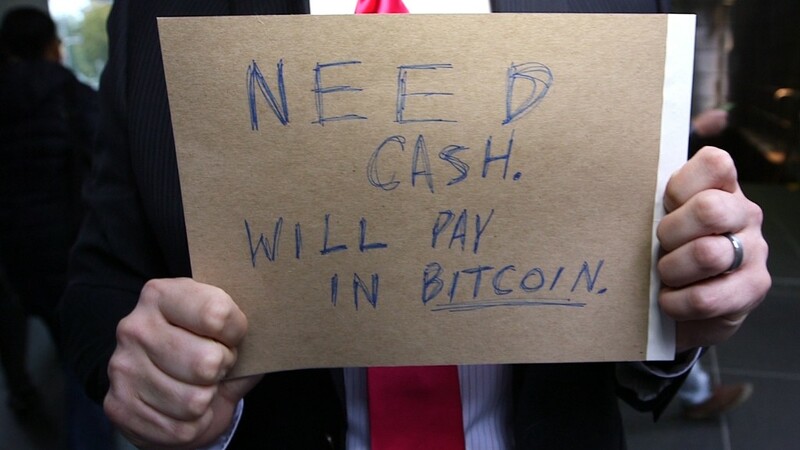 It's an all-digital currency. It belongs to no country. It's recognized by no government as "legal tender." It was created anonymously online. But it's moving beyond its initial devotees, militant libertarians who hate central banks. And there's now a way for investors to get into the action. Just last week was the launch of Digital Currency Group, which claims to have "the largest early-stage investment portfolio in the digital currency and blockchain ecosystem." It's led by Barry Silbert, an entrepreneur who specializes in creating markets for difficult-to-trade items. Silbert launched the firm with financial help from Bain Capital, MasterCard and others. Silbert's funding round helped push the total amount raised in Bitcoin-related companies to just over $1 billion last month, according to several venture capital firms involved in the space. "This signals a broad endorsement that the blockchain is of critical importance to financial innovation," Will O'Brien, a senior strategic advisor to venture capital firm Blockchain Capital, told CNNMoney. "The early days of dismissing Bitcoin as a tulip bubble are behind us." And this is why the price of Bitcoin -- which peaked at $1,151 two years ago and now hovers at $328 -- just isn't that important.